The Oldest Bridge in Naples? It's hard to say, but that is how the newspapers described it the other day. The bridge is located many meters beneath the courtyard of the Girolamini monastery, accessible by a well located in the courtyard. It was discovered—re-discovered, really—by a team from the National Fire and Rescue Service looking for a place to practice getting in and out of difficult spots. The Girolamini monastery (#31 on this map) is located directly across from the Naples cathedral (Duomo) and thus a very short distance from the crossroads of the ancient Greek and Roman city. They set up their supports and winch at the top of the well and simply went down, down, down like Alice in the Rabbit Hole until one of them called up, "Hey, look at this!" Indeed, "this"—according to the papers—was a footbridge connecting two sections of the old Greek and then Roman "Bolla" aqueduct, the earliest documented conduit to supply the ancient city with water. The bridge, if it really is that old, may have been an expanded Roman version of an earlier Greek structure, but, in any event, the original structure may be over 2,000 years old. Fulvio Salvi of NUG [Napoli Undergound] tells me, however, that since the site has not been studied in any detail, it is hard to know what, if anything, is 2,000 years old and what is the result of building and rebuilding well into the Middle Ages and even more recently. 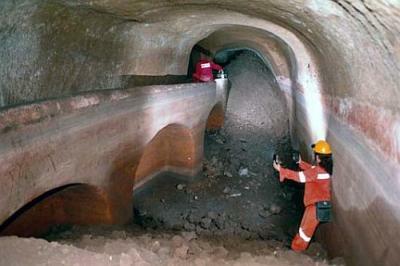 Whatever the case, in ancient times, the Bolla aqueduct brought water from sources near what is modern-day Casalnuovo (a town 13 km/8 miles) northeast of Naples; this is the point where the aqueduct would have split into two sections—one to bring drinking water to the city and the other to provide water for mills. A bridge at that point would have let you pass from one section over to the other. The bridge is in good condition. The bridge still passes over a pool of water, though not the pristine water of ancient times; it is rainwater that has seeped into the underground areas over the years. The site was first uncovered in the 1960s by Clemente Esposito, a true pioneer of urban archaeology in Naples. He was recently kind enough to take me down into one of his other many targets of interest and restoration, this one beneath Piazza Cavour (see this link).